#1 - Bookworm1. We have a birthday boy in our midst this weekend and some fun times planned. Definitely looking forward to celebrating the number FOUR here! We simply cannot believe he is turning four. He asked for a hippo cake. I was hoping he would change his mind about that but he held steady and so guess what mommy made last night? I can't wait to see his face because I found this amazing hippo cake topper that I think will delight him. #2 - Our church. Last year was a rough year in the church department, with the church that we had been a part of for years kinda crumbling apart. Fast forward many long months and we are part of a church fellowship that we absolutely love. Every week we walk out the doors of church totally jazzed because of the teaching we've received. Now, I haven't taken notes during church in more years than I can count. There honestly hasn't been a very good reason to do so. But I'm back to note taking which thrills me to no end! There is so much meat that I can't write fast enough. There is always more given that we can wrap our minds around and think through and it's just......fabulous! Furthermore, there have been clear statements made that they are out to present the Word of God and teach doctrine. Without it, it has been said that we cannot know God. The faithful teaching of the Word of God really challenges, feeds and motivates! We just love it. #3 - Morning sickness abated. A few weeks back I talked about how being sick and pregnant is totally worth it. And it is! But that doesn't necessarily make it fun. I finally got to the point where I couldn't keep liquids down and there was some concern that I'd be leaning towards a hospital stay/IV if things didn't improve. The good doctor prescribed some anti-nausea medication and WOWEE! Life was restored. I'm still on these miracle pills but I'm hoping the end is in sight. In the meantime, I'm grateful, because did I mention that someone is turning 4 this weekend? And I really didn't want to spend the weekend in bed! #4 - Jan Karon came out with a new book. I have a copy to giveaway, if you've missed that, and would like to enter. 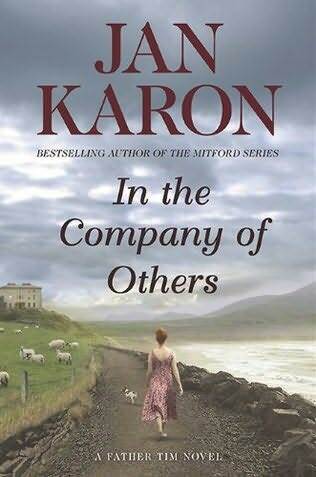 Click here to see my review/enter the giveaway for In the Company of Others (shameless self promotion, yes?). I LOVE Jan Karon. She's the perfect fall/winter/cozy read. Just a delight. Nothing stressful. All entertainment. Characters to love. It was just the kind of read I needed! #5 - Lastly, I'm grateful for my Texas-lovin' SIL who is also pregnant and sympathizes very, very well. ;) I like her sweet spirit, her fun attitude, her love of kids, her support of my brother, her passionate faith, her "keeping-going-when-the-going-gets-tough" attitude and her general likability. All this even though she can't get over her home state in a way that I disagree with. It's our biggest disagreement and I can live with it. IF I must. (And I do believe I must!) I was going to post a picture of the two of us in our pre-married/pre-baby days but I didn't ask her permission first so we'll just have to wait on that. In the meantime, I hope you all have a perfectly lovely fall weekend! BLOG ANNOUNCEMENT: I've had several giveaways running the past month or so and I have not created new posts to announce winners. Instead, I've e-mailed winners on the side and have closed old posts and contests and posted the winners on the original contest post. I've decided to do this because I dislike flooding your readers with extra posts for one sentence announcements. I DID want to reassure you that I'm keeping up with the contests and if you didn't hear that you won it's because, well, someone else did. But they have been made aware of that fact and books are headed out! If you all do not mind seeing extra posts with announced winners, let me know. For my part, I just assume it's another post to scroll past and so I've opted to spare the masses. Wahoo on your pregnancy and that your morning sickness is lessening. Blessings indeed. I am a note-taker. If I don't take notes I cannot pay attention. I love my church too and for the same reasons. In fact this morning I woke up (at 5 am!) with an idea to write about 10 surprising things you'll find at our church. I got a good rough draft done before heading off to the rest of my day. I hope you post pix of the hippo cake. What a challenge. Sounds like you managed nicely though. If it's on your blog - why not be shameless and self-promote? :) Thanks for the review. I will have to have a looksee. Thanks so much for your lovely words on my blog - it's very encouraging! Hippo cake? You’re quite the mom. Hope he has a great 4th birthday! Fun times. How blessed you are to have such a fabulous church. I pray it continues to grow. Oh, so glad to hear you’re feeling better! Being nauseous is so miserable, no matter how good the cause. You have such a great attitude though. Loved what you wrote about children being worth it. Happy birthday to Bookworm1. A church fellowship you love is a wonderful thing to have. So glad to hear that your morning sickness is starting to subside! I've done the same thing for giveaway winners ... but sometimes I save up a few winners and post one winners announcement. I think that, if you're consistent (i.e., unlike me), it's good either way. Yay for the morning sickness to be on its way out!! We, too, are in the midst of deciding whether or not to leave our church. We love our pastor...he married us...but it is a smaller church with an older congregation, so, in return, there is nothing offered for my kids. We are considering and praying about finding a church with more for my kids to get involved in! Glad to hear your morning sickness is not as severe now. I struggled through all my pregnancies with morning sickness, well all day sickness, really, so I definitely relate. A hippo cake topper? You are awesome to find an item like that! I totally love to take notes during sermons. I'm so glad you are getting fed at your church. It's so important! So glad your morning sickness has abated! Hope you're able to enjoy the weekend to the full. I relate to your church comments. A good church is so much more to be appreciated after an experience like you describe. Ditto to all of the above :-) Especially excited that you're in a church that's meaty--and that your morning sickness is getting under control! congrats on the pregnancy and on the birthday of your son. Happy birthday to Bookworm! I'd love to see a picture of that hippo cake. I love to take notes during church! So glad to hear you got miracle pills for the morning sickness. Take care. So glad you are feeling better......that is worth a big yahoo!!!! And having a dear SIL to share the experience with is a true blessing! :) Happy Birthday to your big 4 year old....such a FUN age!!! That was a really fun fav list! Happy birthday to Bookworm 1! So glad the hippo cake worked out. And that you're getting some relief from morning sickness. I'm especially glad you found a Word-teaching fellowship. Thrilling! Re: winner announcements: whatever way you want to do it is fine by me. So glad you are a part of a church you enjoy again. I often take notes in church because it helps me to remember the sermon. Sorry about your nausea, I know how that is and its hard to handle. Glad you are feeling better. That Oregon pic makes me laugh...Oregon is a bit full of itself if it thinks it's as big as Texas! SO glad you found a good church home. I think that makes all the difference! I've been at mine for 5 years, and I love it even more today than the day I joined! YAY for the new meds that help you feel human!!! And I hear you about the church thing. We haven't felt very connected in our church ever and this past year we are really liking our new pastor. His messages don't put you to sleep, but make you sit up and think. And there's some action behind them (as evidenced by our Sunday 2 weeks ago!). Yay for that! Happy Birthday to Bookworm! Four years old is such a wonderful age! I'm glad you're feeling so much better. Have a great weekend! I'm glad you are feeling better. Getting that ill is not fun. I'm very much a note taker in church too. Keeps my focus. Happy birthday to your bookworm. Way to go attempting a hippo cake. I see you've read some of the Great Lives series. I love those books and have a few in book basket to read too. So glad that anti-nausea med is working for you! And for that lovely four year old boy. I wanna see that hippo cake! Your joy in your new church experience sounds wonderful. That's how it ought to be -- joy brimming to overflowing. What great fellowship and learning together. LOL! I love the things you are thankful for and feel very honored that I made the list!!! :) As you can tell from the date stamp I am WAY behind on reading my blog list AND it is 2 in the morning MY time...hence I am up because your niece to be decided tonight was a good time to practice her dance moves. So, I was up and thinking of you... Thanks for thinking of me too! Love you!